...for the want of a better title. 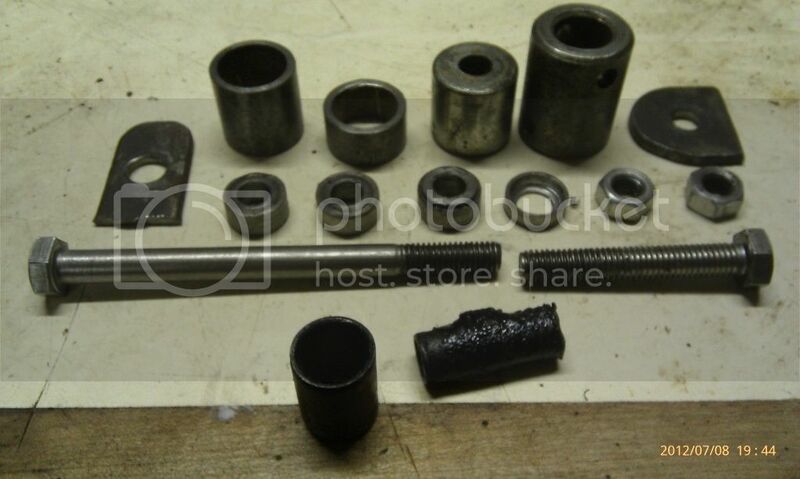 (c) the bolt which joins the forked end of the fixed rod to the gearbox is a very loose fit (in the tail of the gearbox). The bolt itself isn't worn enough to account for this. (a) and (b) are problems I have managed to cure using new or newer parts, but (c) remains. I can't remember how this goes together - I presume there should be a rubber bush mounted in the gearbox hole which the bolt is a close fit in, but the last time I took one of these apart was about 20 years ago. Sorry if this is in the wrong section, I suppose this section is meant more for answers than questions - please can someone move it if that's the case! Purely because I was digging through Photobucket for images for the forum, I came across this photo. This is what I used to change the bush on the FD housing where the rod change yolk connects - bits of it were used to remove the old bush, other bits were used to draw the new one into position. That's the old bush below the two long bolts, it was definitely overdue for replacement! Ah! he must have been an electrician! You been found out Sir!! Me: 1964 apprentice Fitter and Turner, Cowan & Sheldons, Crane maker and engineers, we even built steam powered cranes! In 1969 I became a design & detail draughtsman and it has all been downhill from then! Children's portrait photographer, tractor driver/farm manager in Saudi Arabia, glider tug pilot, Class 1 HGV driver, computer programmer (that lasted much longer than all the others! ), taxi driver, service driver for a BMW garage, computer programmer again, mobility scooter agent, is the story so far. However, I'm thinking about quitting BMW if I can get my Class 1 (or LGV, I think they call it now) renewed, but I'm waiting for the weather to improve first!